Not everyone agrees with the so-called 'stealth' look of plain deep rims. Atleast not a company called Wheel Tags and its customers. The brainchild of three avid cyclists, Wheeltags was the ultimate solution to melding passions, experience, friendship and intuitive design. 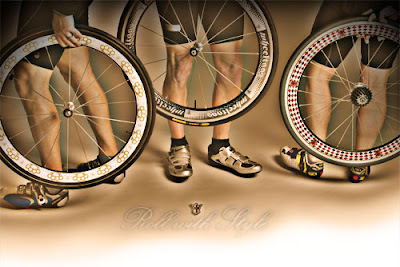 Kevin Koval, Matt Tanner and Jenn Vona created Wheeltags with an eye on today’s bicycling industry and the thrust of customization and personalization into commercial markets. Inspiration came when a business acquaintance at Roark Custom Titanium Bicycles asked Matt to assist him with a custom disc wheel design. Although airbrushing was the standard method of obtaining unique colors and shapes (with impressive coverage), the Wheeltags team quickly realized there had to be a better way. 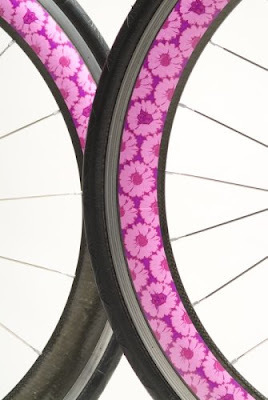 Unmatched in durability and ease of application, vinyl lettering and full-press printing could offer bike rims the opportunity to finally stand out amid the grim, gray rolling masses. I want one that'll say "Follow me or get out of the way." Too long I think.